After more than a year of hardball bargaining led through Mayor Rahm Emanuel’s office, the city appears to have closed in on a deal for a massive expansion of O’Hare International Airport’s passenger area, with dozens of new gates and 3 million square feet of terminal space to be added by 2026. The deal is expected to be officially unveiled within days and introduced to the City Council this week. But that schedule could slip amid a last-minute dispute over whether to grandfather in five new gates American Airlines has been building off the L concourse in Terminal 3, or whether to count them against the carrier’s share of the new gates. Though other big airports around the country are expanding, too, landing the deal on gates and a related O’Hare master lease agreement would be a major coup for the airport, whose position has slipped in recent years, and for Emanuel, as he prepares to seek a new term. It also would allow the city and the carriers to take full advantage of the billions of dollars they’ve spent in the past decade for new and relocated runways at O’Hare. The overall price tag: more than $6.1 billion, not counting other elements already underway worth hundreds of millions and possibly billions of dollars. This latest work would be paid for with landing fees from carriers, seat charges for passengers, ancillary income such as concession revenue and possibly some federal grants. Among other key items: new gates not only for O’Hare’s dominant carriers, American and United Airlines, but discount carriers that have been seeking more space; new international space that would allow baggage to go directly to domestic gates, rather than forcing passengers to recheck items after emerging from customs; huge additions of club space for upscale passengers; and construction of a 10,000-space employee parking lot on O’Hare’s western edge that officials say could be the first step toward a western terminal that DuPage County economic leaders long have been pushing for. At its core, the plan is similar to one outlined by city Aviation Commissioner Ginger Evans in a speech last September to the Economic Club. There are three key elements. 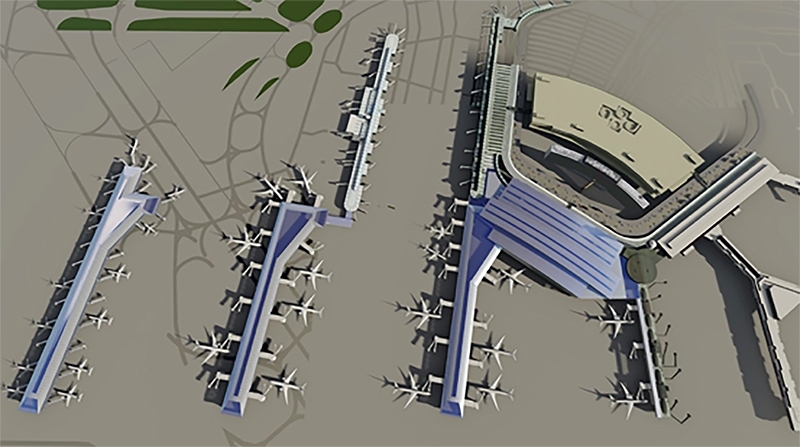 First, two satellite terminals would be built to the west of Terminal 1, connected to the main terminals via walkways and tunnels. Terminal 1 now is used by United, O’Hare’s largest carrier. 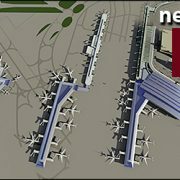 Second, the existing Terminal 2 used both by American and United for domestic flights would be demolished and replaced by an expanded international terminal, with customs and border-protection facilities. Third, doing both would allow United and American and their international partners to shift operations out of the existing international terminal, Terminal 5. 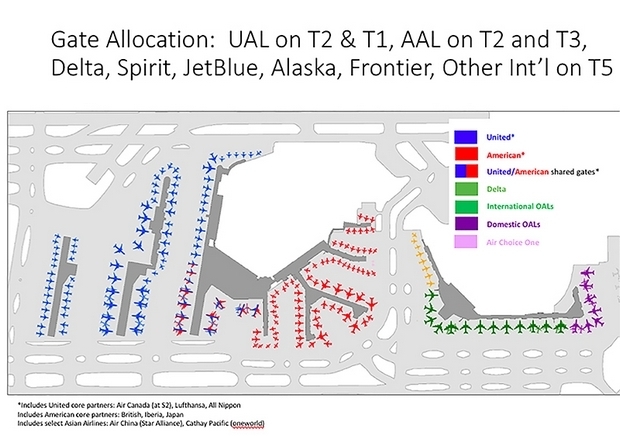 The new T-5, which already is getting nine new wide-bodied gates under a previously announced deal, would house all operations of Delta Air Lines and its partners, as well as become the new home of discount carriers Spirit, JetBlue, Alaska/Virgin and Frontier. It appears the latter would get a net gain of five to 10 new gates, with some of that already underway via a gate swap with American. The western parking lot is a major new element, aimed in part at suburban leaders who agreed to allow O’Hare to add runways in exchange for economic opportunities. The parking lot would include security features to allow workers to check in and then be bused to their final destination. A more sophisticated people-mover system would come later. City insiders describe the parking complex as putting O’Hare on the path to a potential western terminal, which they believe will be needed after 2030. 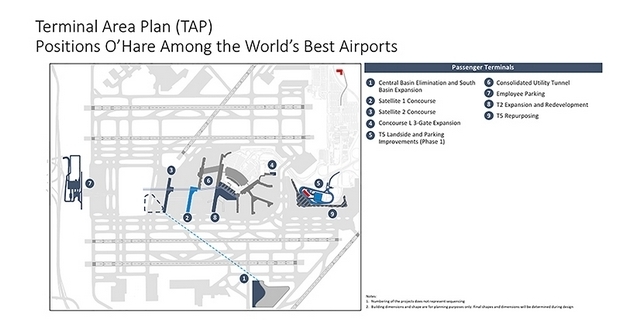 Overall, total space in O’Hare terminals would go from 4.3 million square feet now to 7.4 million square feet. Total linear frontage for aircraft parking in this Phase 1 plan would leap 22 percent, with O’Hare adding more than a mile of airplane frontage. 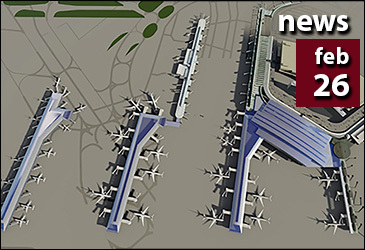 Doing all that would allow an additional 30 to 34 planes to park and accept passengers, including the nine new T-5 gates under construction and the five American is building. However, those figures are a mix of spaces for wide-bodied and narrow-bodied aircraft, so the number added depends on how you divide up the space. O’Hare now has roughly 186 aircraft spaces. Those five new American spaces have become a sticking point in talks, with American wanting them to be on top of whatever it gets in new gates, and United wanting them counted as new, inside sources say. With United and American fiercely competing for space, final negotiations were handled personally by Emanuel, who repeatedly met and talked with a senior American executive at City Hall last week. No final deal on that had been reached as of late last week, but talks were continuing and there is a possibility the city would proceed anyhow. I’m told that in one new feature, airlines would be given their choice of how long of a lease agreement to sign. The city’s current long-term lease applies equally to all of the carriers. Also, income from concessions will go to pay for the new construction, rather than directly into the pockets of the carriers. Insiders say the changes should make O’Hare not only bigger but more efficient, with international flights closer to domestic gates and walking distances shortened. The city also has announced plans for a new hotel across from T-5. Details on later phases of O’Hare expansion are not currently available, but as part of this deal, the planning process for the next phase is to begin in 2023.